Towards the end, I must have known somehow. For the last birthday you shared with me, I got us bikes. And then I’d been too over-protective. I wanted to do something for you and for us. Something together and two and joined. The bike shop was really friendly, the one near Dub Rek. The places we’d go, the adventures we’d have. I remember how excited and surprised you were when you saw the bikes. Your face alive and full of love and happy! The alien cranium, gloves and lights. We went for a ride. I was a lot heavier four years ago. Including you, I’ve lost fifteen stone since then. You kept cycling up the hill towards our little house. You never wondered where I was. Even though I always waited for you when you couldn’t keep up with me. But you actually left me that day. 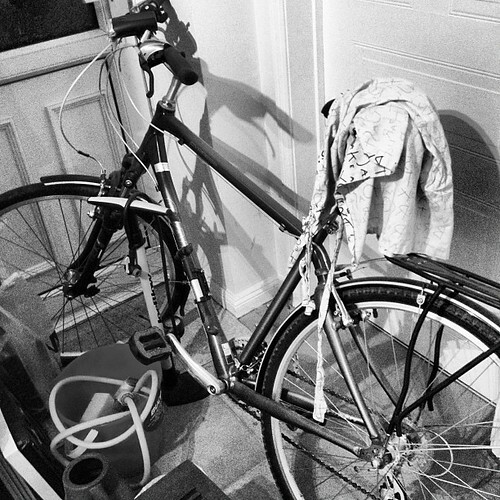 My bike is dusty in the corner of the kitchen. I should probably sell it.